On the Downtown Project's website, among several lofty goals—such as adding ground-level density and creating passionate communities for downtown Las Vegas—one goal sticks out as a bit different, if not simply odd: "Create the shipping container capital of the world." I am not sure that title is something any other city or neighborhood has laid claim to, or even would consider (and I would also say that Shanghai, the world's biggest port, is already, technically, the shipping container capital of the world). 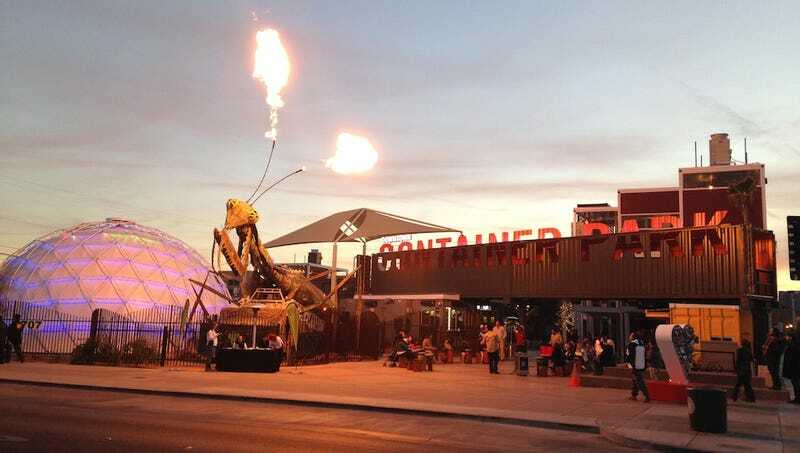 But I understand the reasoning for using containers, as explained on the site: Shipping containers are a quick way to create temporary space in downtown Vegas' mostly empty lots. The brand-new Downtown Container Park is located at the corner of Fremont and 7th Street, a few blocks from the Emergency Arts building I wrote about yesterday. It's the first community-facing structure the Downtown Project has built from the ground up, and it's definitely getting the most attention of anything they've done before. In true Vegas style, it has plenty of curbside charisma. Colorful shipping containers are stacked two and three stories high around a courtyard. Out front is a massive steel praying mantis that spews fire every night at sundown to the beat of a community drum circle. (There are lots of Burning Man references here; the mantis is actually an art car from the festival.) A geodesic dome also sits at the entrance, glowing like an exiled igloo at night. Inside are retail stores and restaurants funded by the Downtown Project, which can use the small footprint to prototype and test their business models. But the most impressive attraction and likely the greatest draw is the giant Swiss Family Robinson-style treehouse. On most days, by lunchtime the tree was swarming with squealing kids. There's free wifi (I'm writing this from the park right now) and live music programmed on a stage every day and night. Treehouse, four-story slide and Imagination Playground foam blocks. Best playground ever? The Container Park has a bit of the Disneyland-esque faux-Main Street vibe, much like many open air malls across the country. But the design is much nicer here and much more authentic. The shipping containers keep the scale approachable, similar to the volumes of nearby motels. It is a wholly pleasurable experience to hang out here. You can drink a beer, watch your kid go down a four-story slide, and eat very tasty tacos. But you can't bring your dog, you can't come in after 9 p.m. if you're under 21, and you might get your bag searched. Security guards at the entrance make a point to make eye contact with every person when they greet them. It's a park, maybe, but it's not a public space. Two blocks further down Fremont, there's another park. It's private, too. Well, it's actually a club. The Hydrant Club, signified by a giant yellow fire hydrant which mists water in the summer, is a private social club for dogs (and their owners). Members pay a subscription fee to get obedience training, doggie day care, and access to the dog park—a soft, verdant oasis among acres of vacant gravel lots. The woman who runs the Hydrant Club is named Cathy Brooks, definitely one of the most interesting people I've met so far. A former publicist from San Francisco who was lured to Vegas by Hsieh personally, Brooks has become the center of the downtown community quite simply because she knows all the dogs (and their owners). In just the short time I spoke with her, I felt like I knew everyone, too; I even met dogs that I'd end up recognizing again on the street a few days later. As people arrived with their dogs in tow, it was clear that this club was building some real relationships—for the dogs as well as for the owners. Still, with both parks, what bothered me was that these weren't just an actual dog park and an actual playground. It's not that private spaces can't serve the public need—Vegas is pretty famous for mastering the art of public space that's actually private in its acres of casinos. But, like some of the other projects in downtown, it again felt like these spaces were designed for an exclusive opt-in audience. My friend Caleb Mulvena of the New York-based Mapos was an early collaborator on the container project (it was eventually designed and built by local firm Breslin Builders). Something he said encouraged me to think about these "parks," in a different way. "It was clear they were after a grassroots approach to urban revitalization and not a carefully planned white-collar utopia," he told me. "They wanted to turn the top-down approach to urban planning on its ear." Mulvena saw the container structure as one of many "cultural generators," using the example of Roberta's, a restaurant (which just so happens to have a shipping container out back) in the Williamsburg neighborhood of New York City that all but singlehandedly sparked development in the surrounding blocks. "What if this could happen in the downtown of Las Vegas," Mulvena asked, "but from multiple nodes at the same time? This ripple effect could spread until they converged, forming a cohesive and vibrant downtown culture without any planners involved, just seed money." As I watched, day after day, as the same people walked their dogs to the Hydrant Club, I began to understand. These are outposts designed to draw this particular audience deeper into the community, to drop an anchor a few blocks away from the current action. Instead of focusing on housing, which would be the knee-jerk planner reaction, the parks are giving people who already live there places to walk to and putting activity on the sidewalks, which might be more important. With the activity there, this vision suggests, soon the gaps on the blocks will be filled, by seed money or other developers. Maybe even by a real park.